Prototype: German Railroad, Inc. DB AG type Dduu 498.1 baggage car. "Traffic Red" basic paint scheme. Without entry doors at car end 1, with vertical roof ends. The car looks as it did around 2003. Model: The minimum radius for operation is 360 mm / 14-3/16". The underbody is specific to the type of car. The trucks disk brakes and a separately applied generator. The 7319 current conducting couplings or the 72020/72021 current conducting couplers, the 73406 pickup shoe, the 73400/73401 lighting kit (2 per car), and the 73407 marker light kit can be installed in the car. Length over the buffers 28.2 cm / 11-1/8". DC wheel set 4 x 700580. Prototypical tooling changes to the car floor and car body. 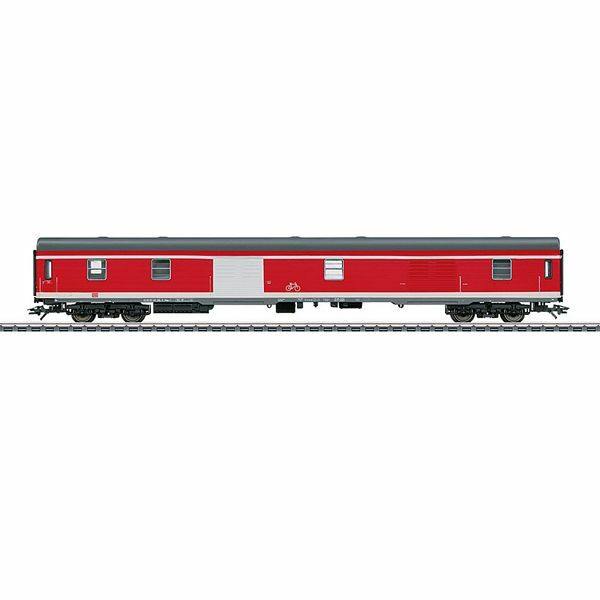 The class 111 electric locomotive to go with this car can be found under item number 37319 in the Märklin H0 assortment. Together with models 43806, 43816, and 43831 this car allows you to make up a typical commuter train car consist in Era V/VI.